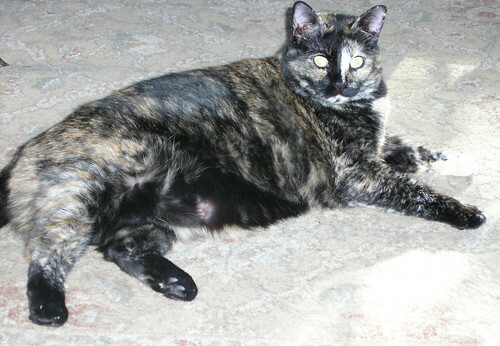 It's been a while since I posted any cat photos, so here ya go -- a picture of Harley, the 'big girl' kitty. 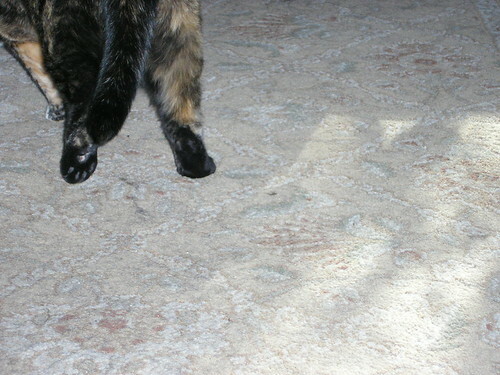 You can't tell it from this over-exposed picture, but her left front paw is tan, which I find absolutely adorable! In fact, it was that paw that convinced me that I had to adopt her, back when she was a scrawny, almost-feral, living-in-a-parking-lot kitty. I usually post pictures of Simon because he's so friendly. Harley, on the other hand, is shy and, for some reason, scared of the camera. Here's what most of my pictures of her look like.